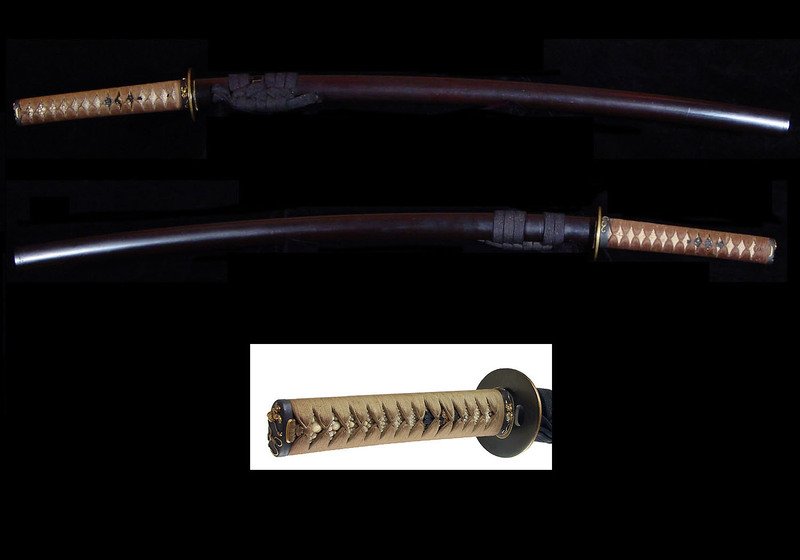 I am pleased to present this very nice pair of Shinto blades with matching daisho koshirae. 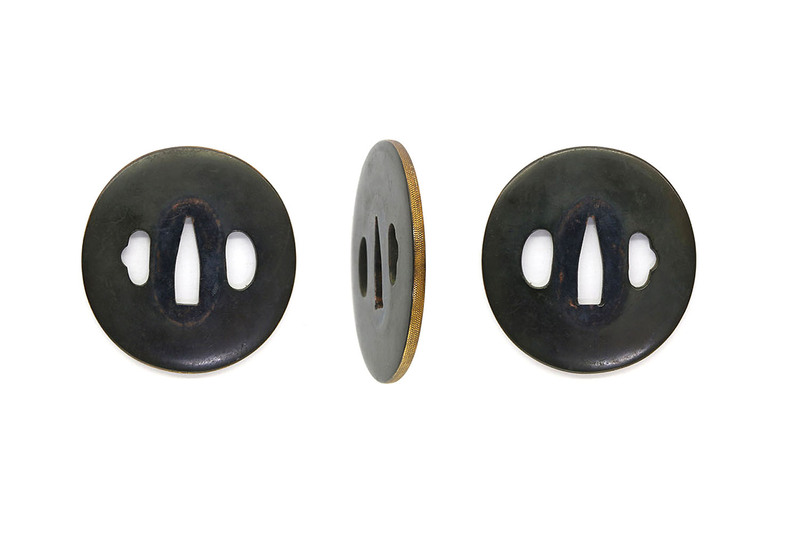 This is a true daisho that was worn by a Samurai during the Edo period. 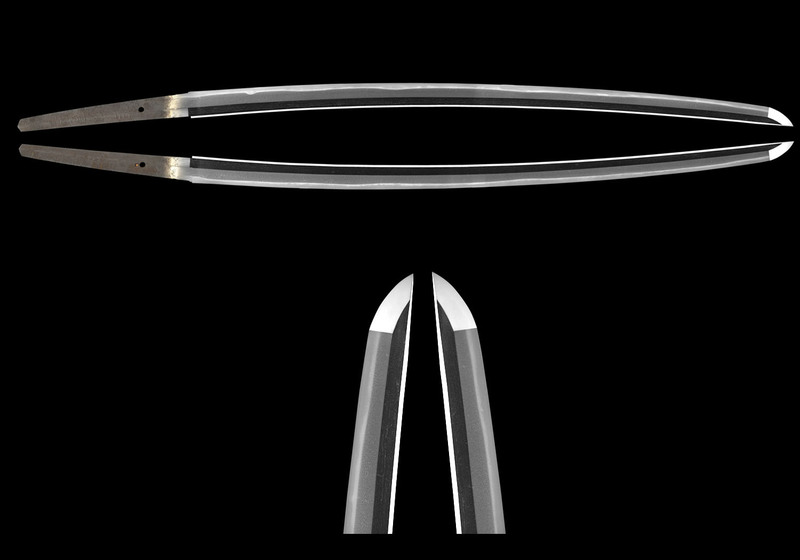 This is not a “put together” set of a katana and wakizashi koshirae in related but not quite matching mounts. 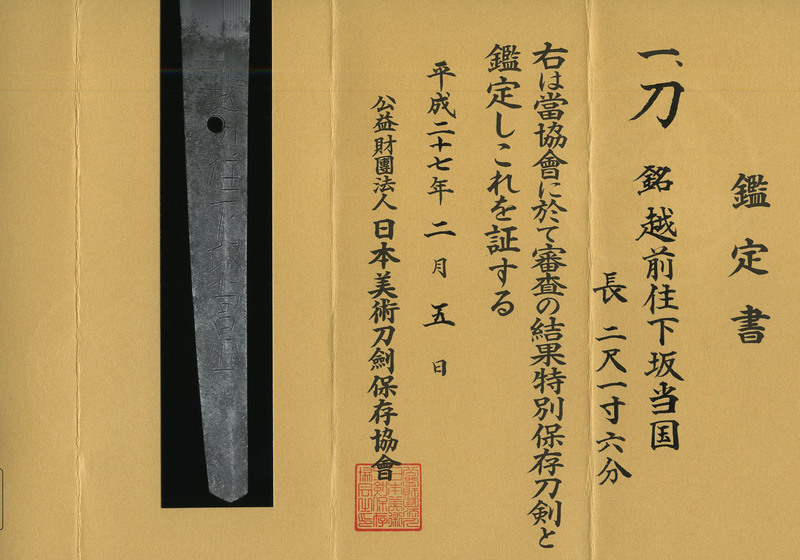 The katana is signed Echizen Ju Shimosaka Masakuni(越前住下坂當国). This smith worked in the Kanbun era (ca. 1661) in Echizen Province. 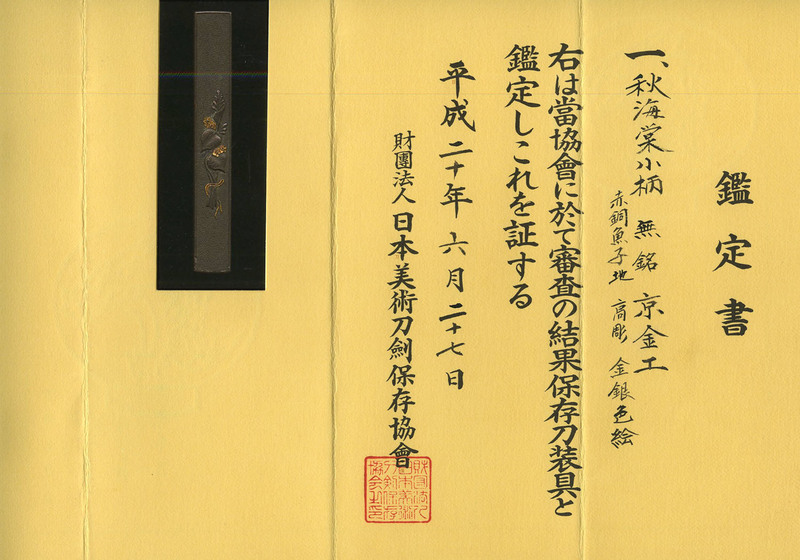 This work closely resembles that of the Yasutsugu school of that province and time period. He would have worked around the same time as the third generation Yasutsugu. 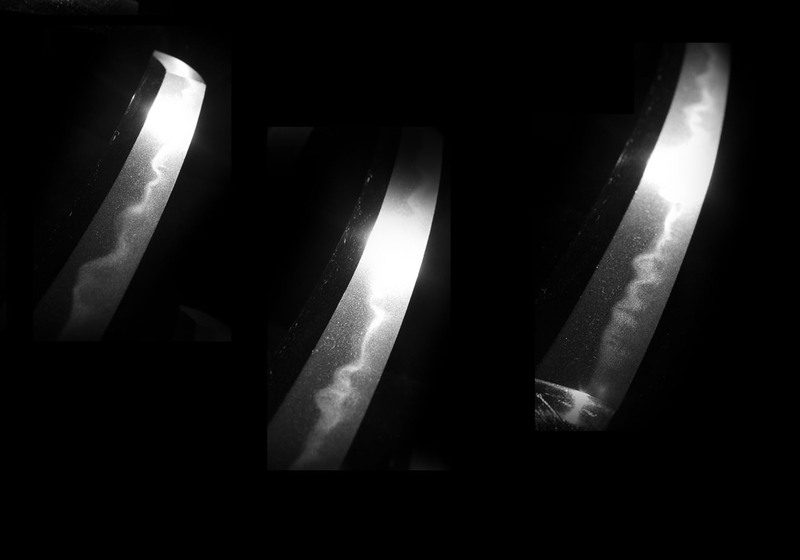 This sword measures 25.74 inches or 65.4 cm in length. 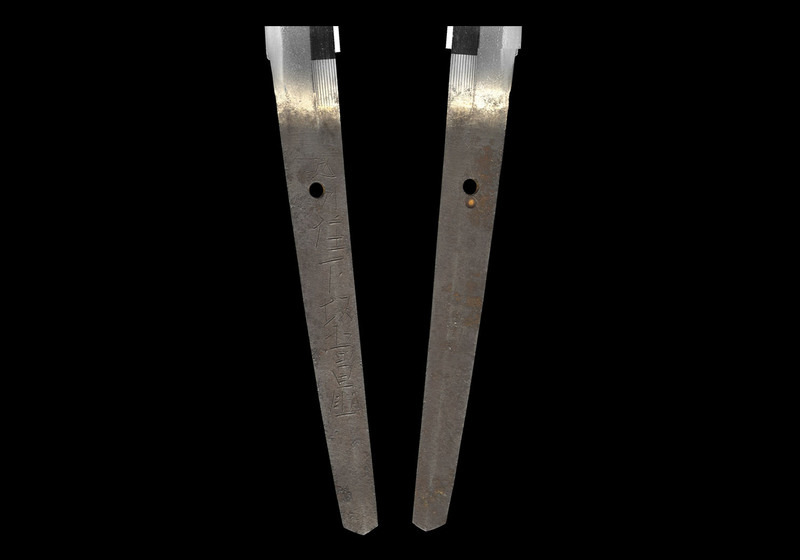 The moto-haba is 1.06 inches or 2.7 cm and the saki-haba is 0.81 inches or 2.06 cm. 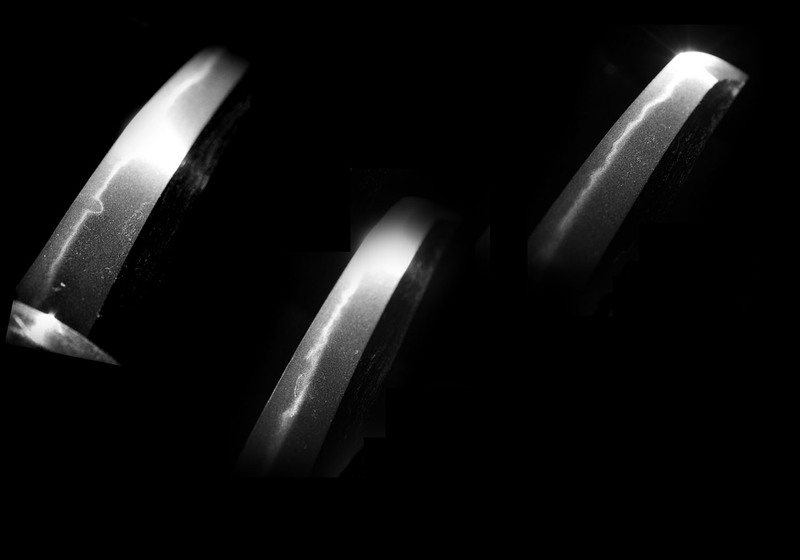 The sori is 0.71 inches or 1.8 cm. 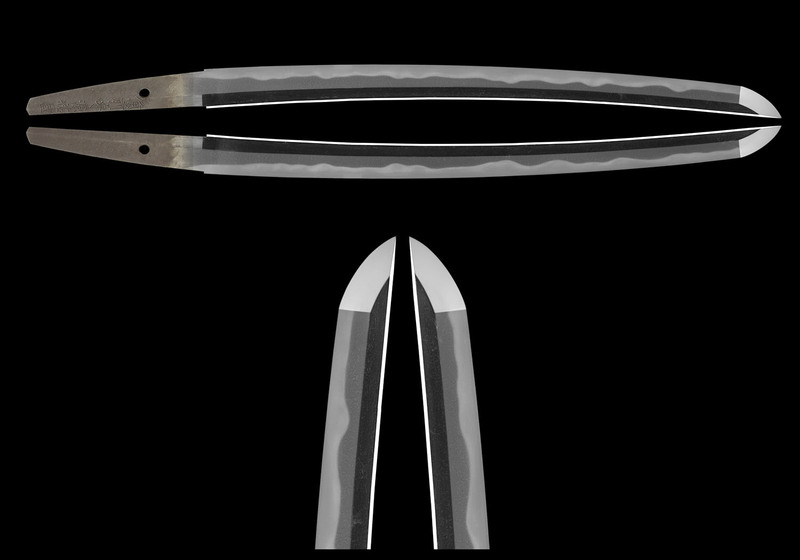 It is shinogi-zukuri in shape with a slightly stretched kissaki. The hada is itame with ji-nie and chikei. 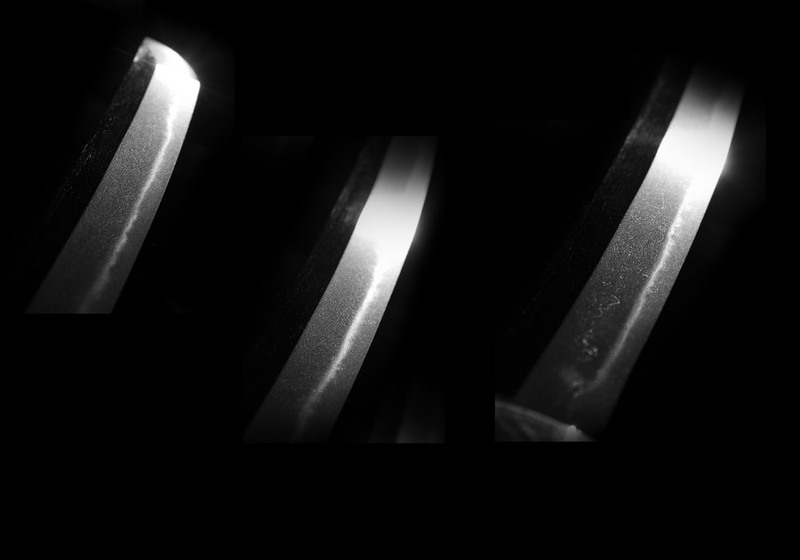 The hamon is nie-deki with small ashi extending toward the ha. This blade is in excellent polish with no flaws or problems of any kind. 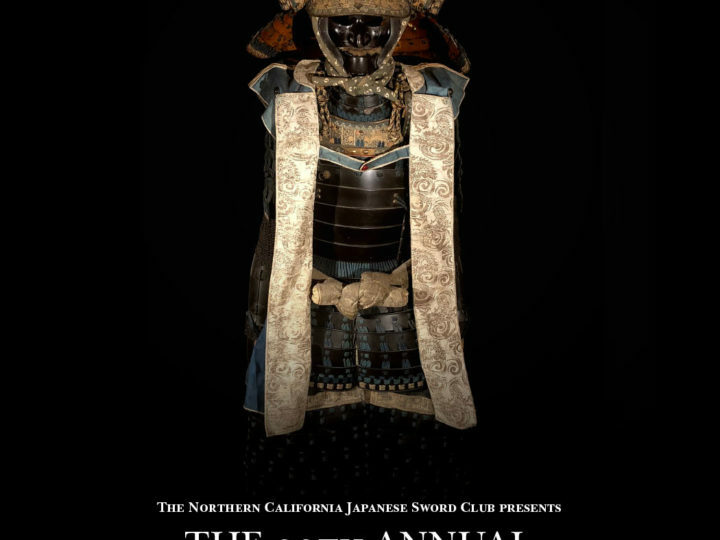 The koshirae has a black roiro saya. 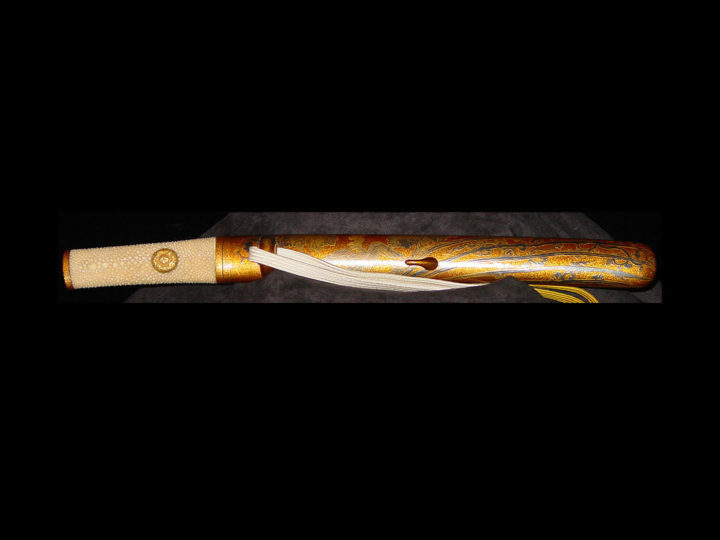 This is an old saya as the black lacquer has taken on that much desired slightly brownish tone due to age. 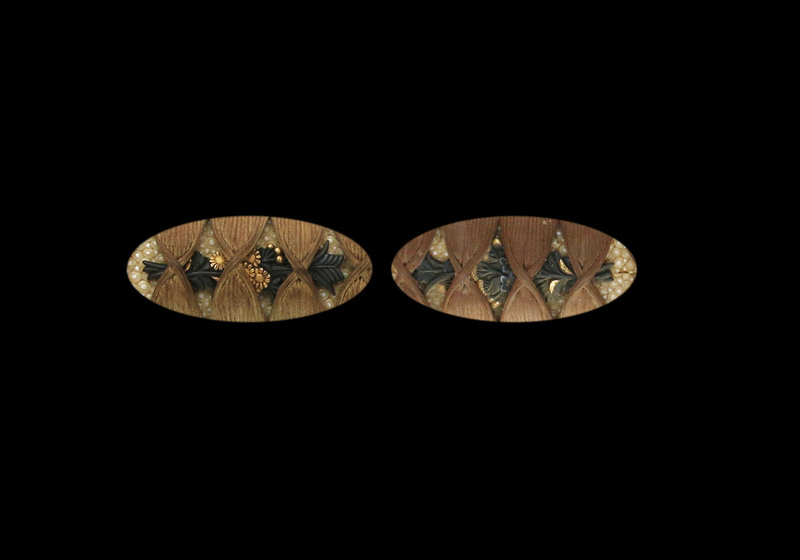 The tsuba is round, made of shakudo undecorated with a very fine and well done nanako. 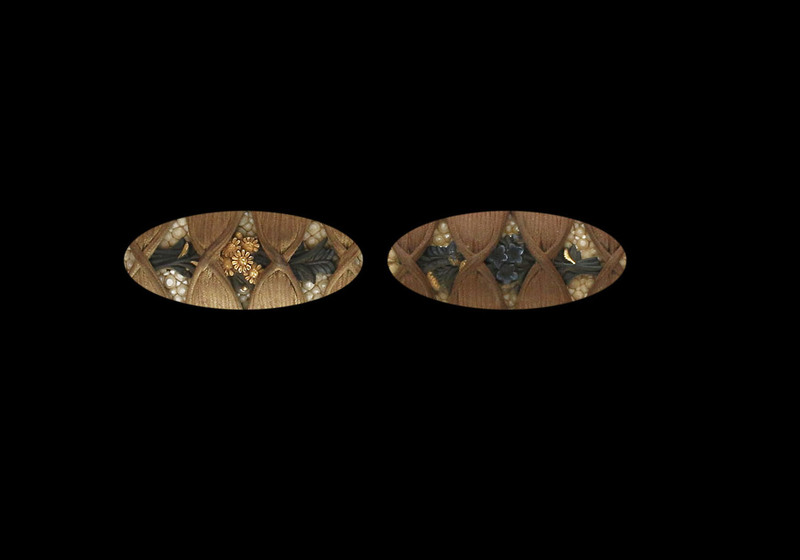 The fukurin (rim) has been colored gold. 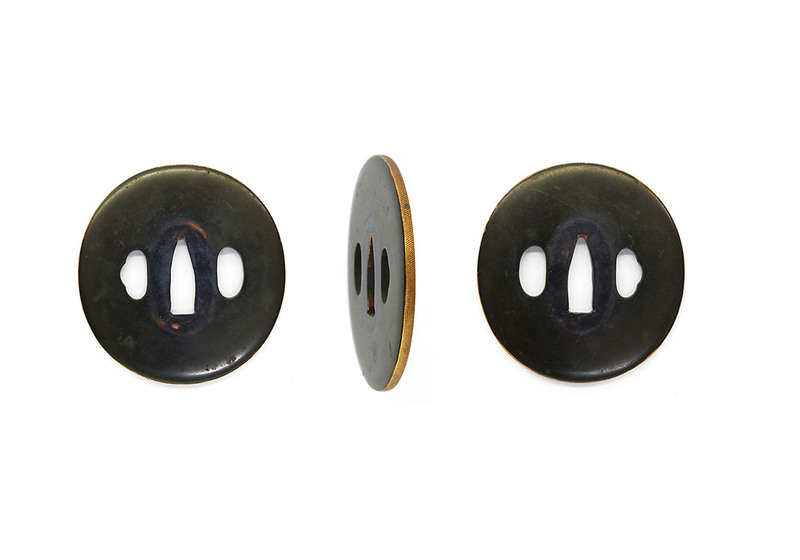 The menuki are chrysanthemum flowers (kiku) that are made of shakudo with gold highlights. 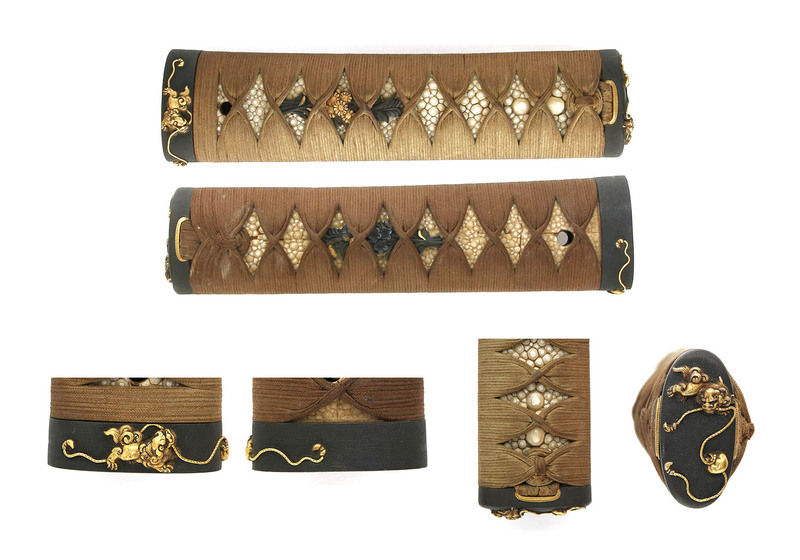 The fuchi and kashira are also shakudo-nanako with a gold shishi lion/dog playing with a temple’s bell. 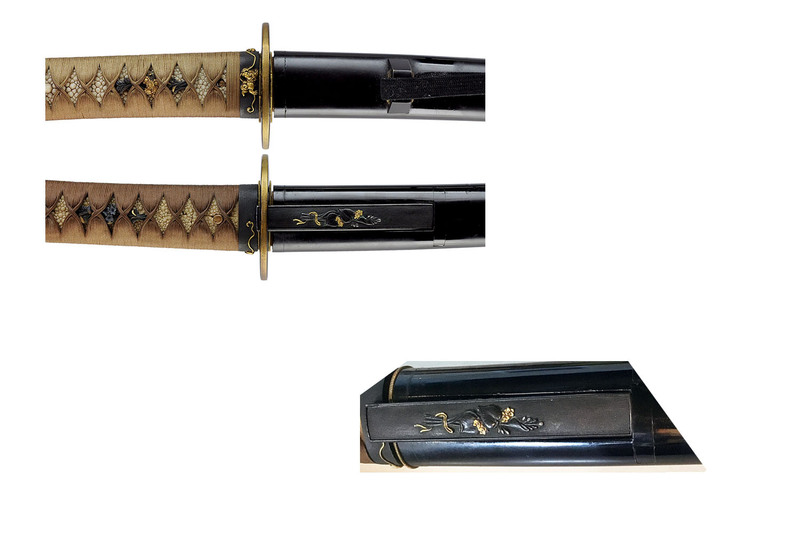 This sword comes with NBTHK Tokubetsu Hozon papers attesting to the validity of the signature and the quality of the blade’s workmanship. 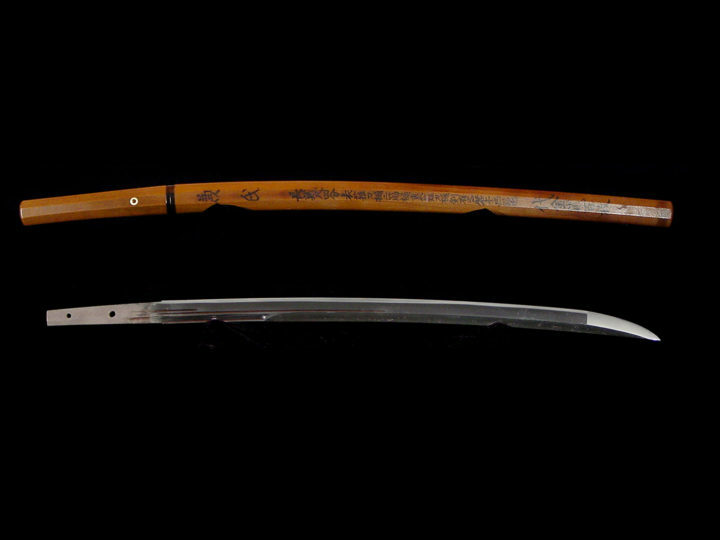 The wakizashi is signed Bizen (no) Kami Minamoto Sukekuni (備前守源祐国). This smith was from the Kishû Ishidô school and he also worked around the Kanbun era (1661). He also signed his name as Bizen (no) Kami Sukekuni (備前守助国). 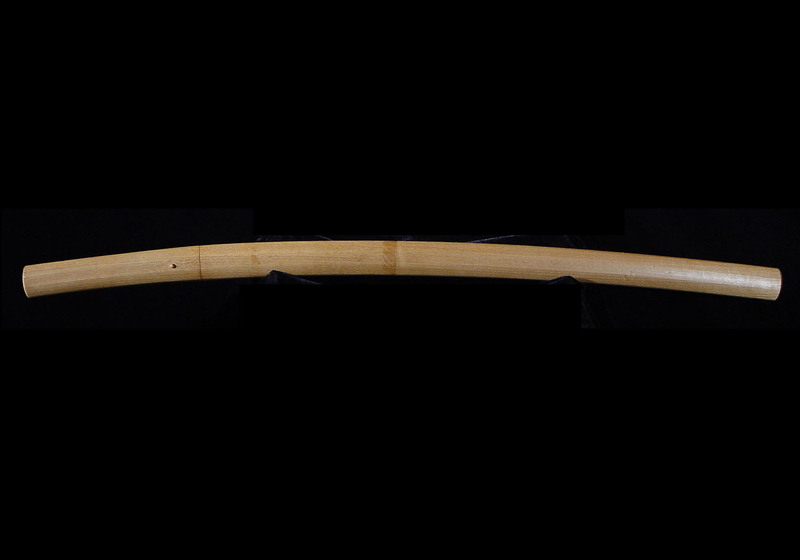 This wakizashi measures 16.375 inches or 41.7 cm. The moto-haba is 1.10 inches or 2.79 cm. 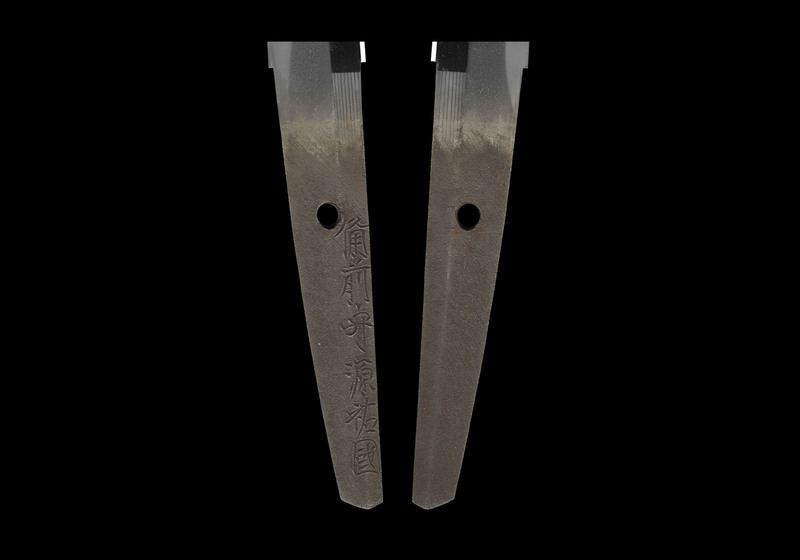 The saki-haba is 0.83 inches or 2.1 cm. 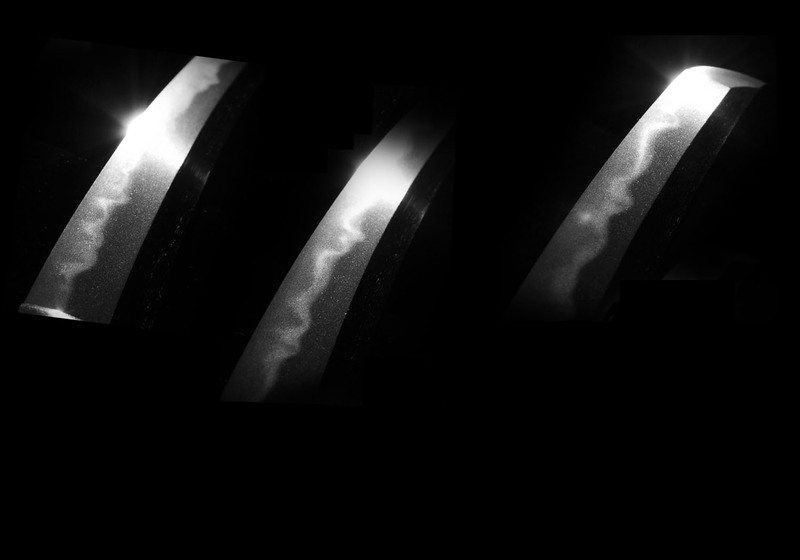 The sori is 0.4 inches or 1.0 cm. 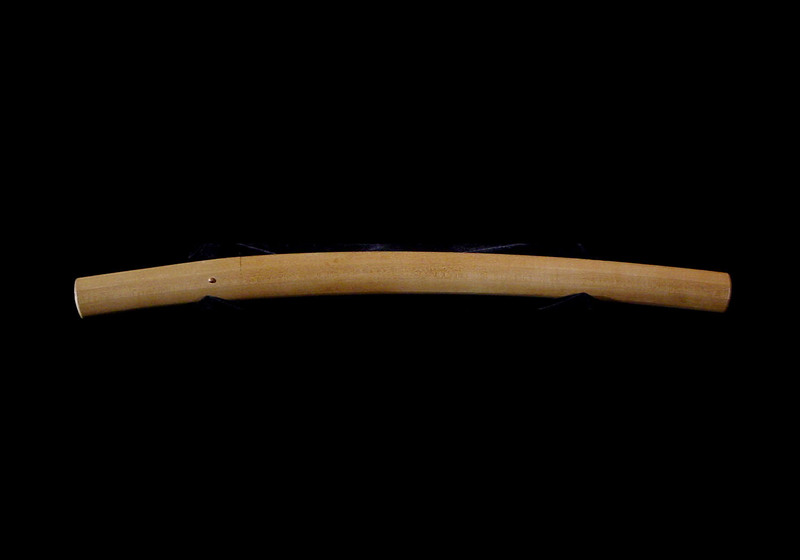 It is shinogi-zukuri in shape with a slightly stretched kissaki. The hada is a ko-itame with ji-nie present. 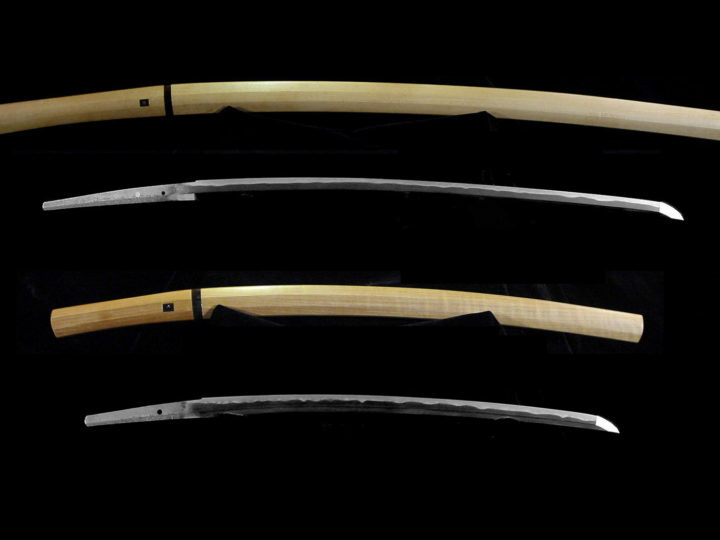 The hamon is nie-deki, gunome-midare with a deep nioi-kuchi. He was well known for his o-gunome and doran-ba hamon styles. This blade is in excellent polish with no flaws or problems of any kind. 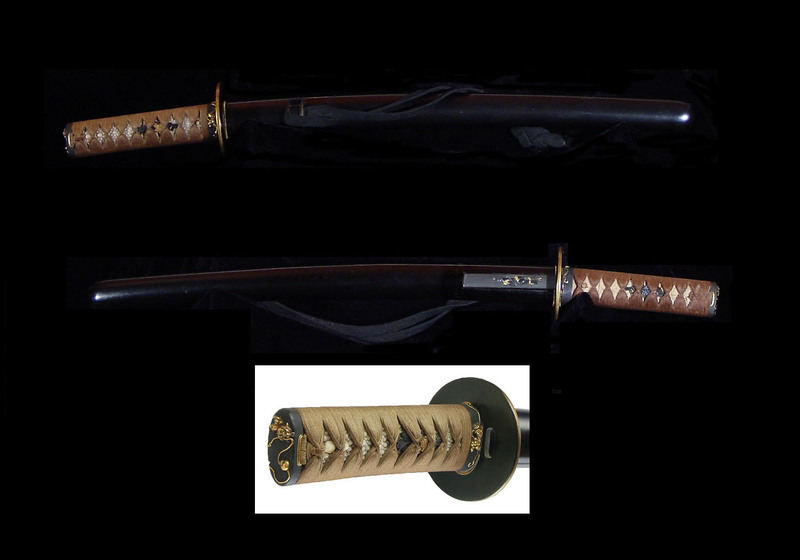 This wakizashi comes in a koshirae that matches that of the katana as has been described above. 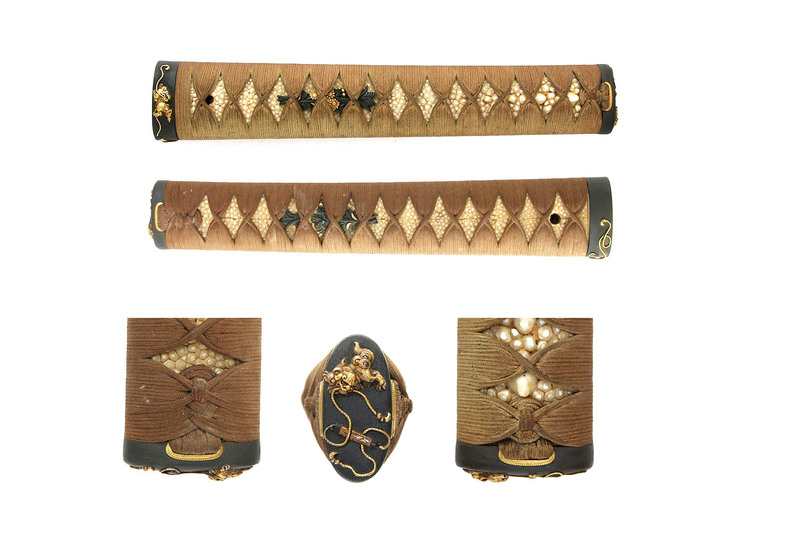 In addition is has a very nice kozuka of shakudo nanako that is engraved with begonia flowers done in shakudo and gold. 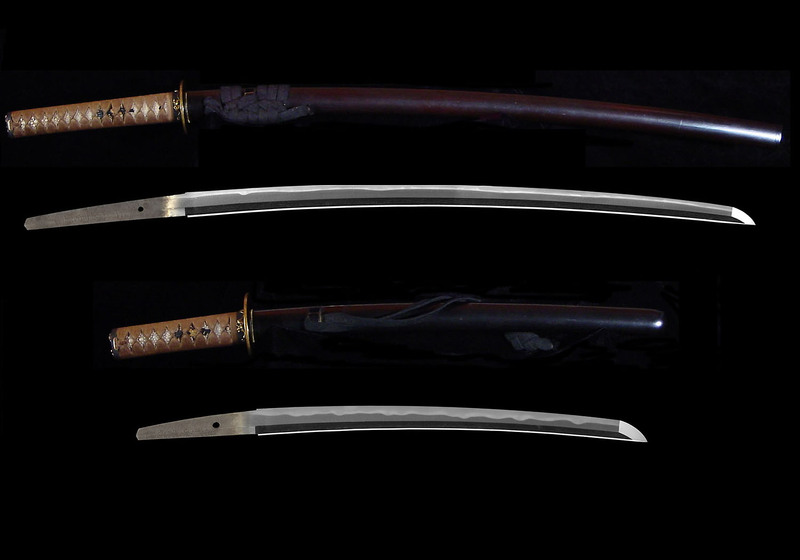 This wakizashi comes with NBTHK Tokubetsu Hozon papers attesting to the validity of the signature and the quality and condition of the blade. 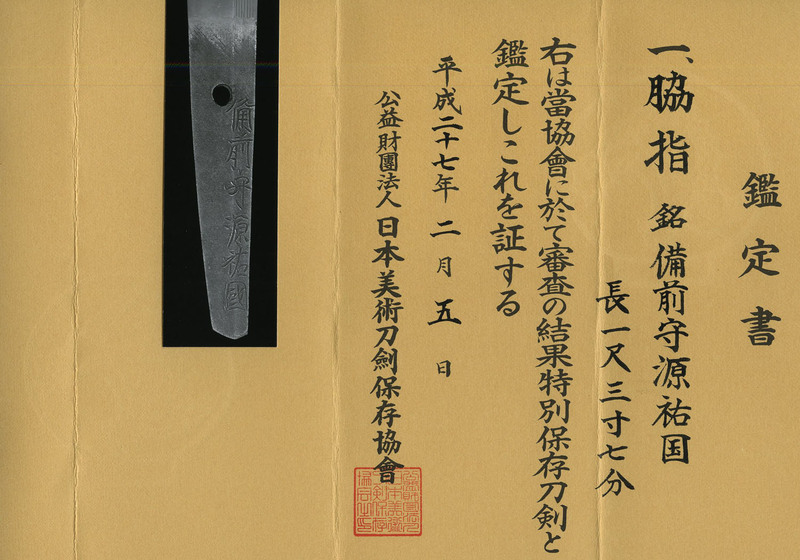 In addition, the kozuka comes with NBTHK Hozon papers attributing it to the Kyo-kinko school.